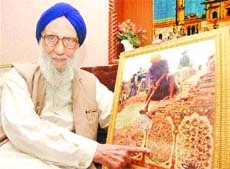 When the two-and-a-half-century old ivory aic work, priceless murals, naqqashi and paintings, depicting mythological scenes were being destroyed in the demolition of Akal Takht in January, 1986, by radical Sikhs, it was on the intervention of Giani Mohinder Singh, former SGPC secretary, that the original podium where Guru Hargobind used to address the Sikh Sangat was protected. The former SGPC secretary, who turned 99 today, told The Tribune that he immediately approached Bhai Gurdev Singh Kaunke, who had been appointed Jathedar of the Takht by militants, after he saw the structure being pulled down. There was nobody who knew the importance of the base of the Takht. It was the biggest achievement of his life that the SGPC agreed to preserve the structure, he added. Giani Mohinder Singh is the oldest surviving Sikh leader who had witnessed the t significant historical events, including Jallianwala Bagh tragedy, pre-Partition Akali morchas, and had worked with the legendary Shiromani Akali Dal presidents like Master Tara Singh. He said the priceless naqqashi, which fell prey to the militant diktat two decades ago, was a specimen of excellence attained by Sikh craftsmen. The craftsmen had dedicated their lives to complete the exquisite artwork in the interiors of the Takht. Frescoes were introduced by Bhai Kehar Singh under the patronage of Maharaja Ranjit Singh. Today, few artists pursue this “Sikh school of art”. Now, the work of gold-plating of the Takht, which remained incomplete after Operation Bluestar in June 1984 for a long time, was re-started through kar sewa. After the reconstruction of the Takht, the gold-plating work on the Takht could not be completed in time. However, hundreds of original frescoes, including that of Hindu gods and bhagats, are in the possession of descendants of Bhai Gian Singh, who belongs to the lineage of naqqashs. The artwork, which has been lost forever, included “jaratkari”, which is known as “munavat”. In this technique a drawing is made on the paper first and later transferred on to a marble slab by the naqqash. The original drawing, complete with colours schemes, is passed on to coloured-stone dressers for cutting patterns from the multicoloured stones. These patterns are then set on the slabs by the “pather-gharas”.